Prickly and Bitter: Orange you glad I didn't say banana? 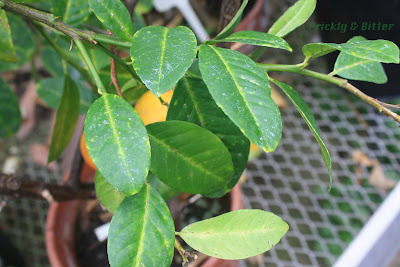 Any kind of citrus is interesting; very few of the types of citrus we grow around the world are pure species and almost all of them are hybrids. The sweet orange, perhaps the most common and the most widely recognized type of citrus fruit around the world, is a hybrid between the pomelo and the mandarin orange (but determining the exact parental lineages are difficult). The only citrus fruits that are pure species are the pomelo, the Mandarin orange, the key lime, citron (not lemons! 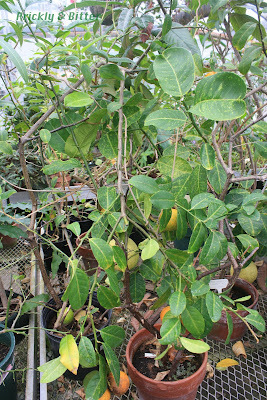 ), Australian limes (3 species), kumquats, and Indian papedas (4 species). Of those 12 species in total, almost 100 hybrids exist that are used for various purposes around the world. 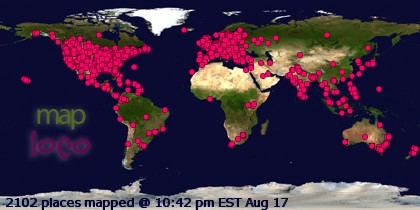 An incredible amount of diversity from a small number of species! 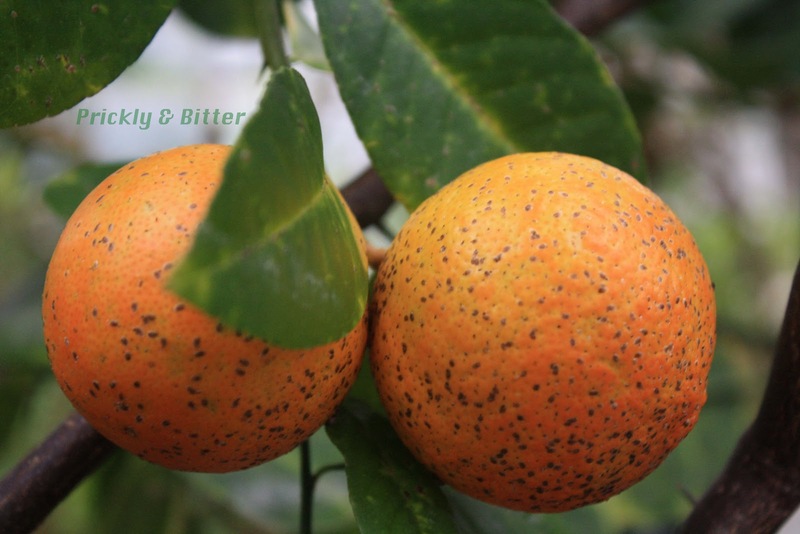 The orange is native to Southeast Asia and has been cultivated in China for more than 2500 years. There have been hundreds of varieties developed since then around the world, ranging in habitat from Florida and California all the way to their native range in China. 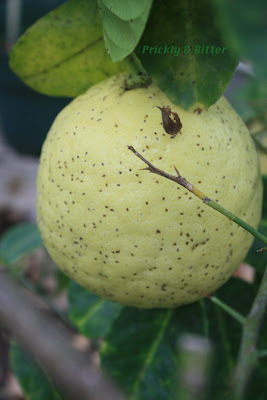 The ponderosa lemon, which apparently makes amazing lemon meringue pies (sweeter than regular lemons, so less sugar is needed in the filling), is native to Maryland in the United States, where it is thought to have originated from a chance hybrid seedling. Citruses are all genetically very similar, since they originate from such a small gene pool (despite having an enormous amount of morphological variation). This means that many hybrids are all susceptible to the same diseases, and the disease illustrated on both the ponderosa lemon and the oranges is something citrus farmers struggle with every growing season. It's called the citrus canker, and is caused by the bacterium Xanthomonas. It has no effect on humans, and other than affecting the appearance of the fruit it is perfectly edible when it's just the small black spots. Larger black spots can make the fruit inside a bit squishy, but there is no danger in eating it. Unfortunately for the citrus tree, it's not so lucky. When the canker infects the leaves it can cause them to fall off before they are ready, which decreases the ability of the tree to photosynthesize. Less photosynthesis means less sugar production, and a lower fruit yield. 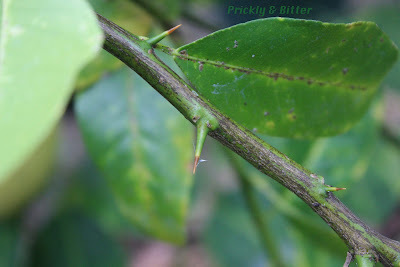 Entire groves have been destroyed trying to eradicate the disease, but it can persist in the soil so these attempts have not been successful. On top of suffering from early frosts in recent years, the United States orange industry is suffering from a dramatic reduction in yield in orange groves because of the citrus canker. Does this mean Tropicana orange juice will eventually be produced from oranges grown outside of North America? It's hard to say for sure, but we have reached the point where we need to find a better solution to the problem or else we might lose some citrus hybrids forever. The grapefruit is the most susceptible of any Citrus species, and will probably be the first to disappear.